Greg is back with another episode of Shack's Arcade Corner that is a do-over from the early days of the series. 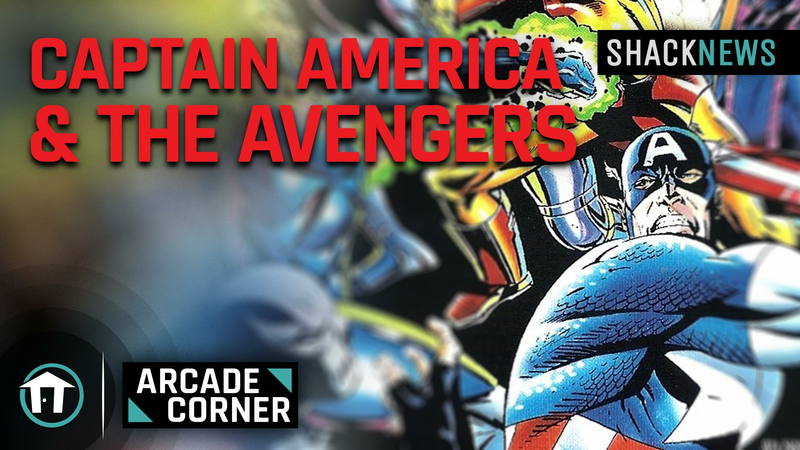 This week, we take a look at Captain America and the Avengers. We're back with another re-do episode of Shack's Arcade Corner. This week, we take a fresh look back at Captain America and the Avengers. The game hit arcades in 1991 and was produced and developed by Data East. The arcade cabinet was a side-scrolling beat-em-up, and featured four characters from The Avengers Marvel Comics series. Players could choose from Captain America, Hawkeye, Vision, and Iron Man. The game featured a very funny pronunciation of Iron Man that is basically engrained in my brain. Marvel was able to experiment with their video game licenses back in the 1990s before Disney came in and acquired their IP, and this game was one of their best gaming results. The arcade cabinet came in two styles, one allowing for two players co-op and the other supporting four players. The game had great comic book art style with words like "twak" or "smash" appearing to add to the sound effects. The backgrounds were also super detailed. Captain America and the Avengers also had some awesome tunes, sporting a great soundtrack for an early 1990s arcade cabinet. The voice acting was pretty dang hilarious in the game and has left an indelible charm that leaves me smiling whenever I think about the game. Please take a look at the episode to find out more about this classic arcade beat-em-up. For more great videos, including interviews and gameplay, check out the Shacknews and Gamerhub.tv YouTube channels. If you have a suggestion for a future episode of Shack's Arcade Corner, please let us know in the comments section or tweet @shacknews and @GregBurke85 with #ArcadeCorner. Did you play this game back in the day? Let us know your memories in the comments section. Nice! I loved this game is was so good, was right up there with Spiderman 1991 by Sega. Data East was easily one of my favorite Arcade dev along with Capcom. Love to see Shack's Arcade Corner back, thanks Greg!